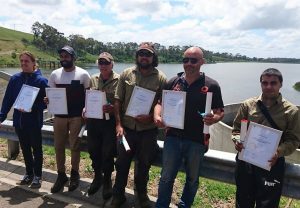 Six Indigenous Victorians received their Certificate III in Conservation and Land Management this week as part of a training program aimed at supporting Traditional Owners to strengthen their cultural knowledge and increase their work in natural resource management. The program was developed by the Port Phillip and Westernport Catchment Management Authority and Trust for Nature in response to feedback from Traditional Owners. A key aspiration for Indigenous organisations in the Port Phillip and Western Port region is to increase their work on Country and increase the number of Indigenous people employed in land management. The course involved members of the Wurundjeri Tribe Council’s Narrap land management team and employees from Westernport Water and Bass Coast Landcare Network. The course was developed in partnership with the Holmesglen Institute and involved field-based assessments where students worked with 10 landholders on the Mornington Peninsula who have Trust for Nature conservation covenants. The properties cover a total of 100 hectares and are important habitat for a number of threatened species of plants and animals including Leafy Greenhood, Common Dunnart, Swamp Skink, Powerful Owl, Australasian Bittern and communities such as Swamp Scrub and Coastal Moonah Woodland. The course also provided a great opportunity for two-way learning, with students learning about land management while also sharing their cultural knowledge. The project was funded by the Victorian Government though the Biodiversity On-Ground Action grants program.